It is an open secret that engaged employees are the key to success in today’s highly competitive market place. Engaged employees are far more productive, less likely to churn and tend be far more aware of market reality and deliver results. On the other hand research into human psychology has proven time and again that human beings are inherently anxious to be engaged at work and want to make a difference. Considering these facts, one wonders where the disconnect is. Repeated surveys have shown that a significant fraction of the active work-force is disengaged from their employers. There are thousands of books, research papers, articles, and of course blogs (yes, like this one) that have tried to uncover the magic equation behind true employee engagement. 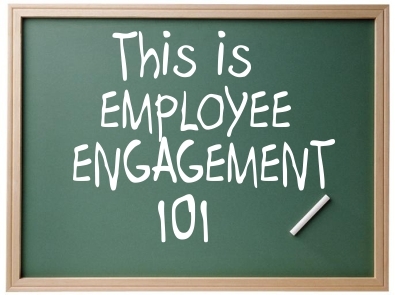 Companies are spending millions in the search for the elixir to get their employees engaged. Maybe its time for everyone to take a step back from all the activity and analytics and ask: What does an engaged employee look like? Think about it – when you are spending long hours (and lots of money) in the search for something, it would make sense to be able to identify it when you see it. And this is exactly the question that Dr. Timothy Clark tries to answer in his book “The Employee Engagement Mindset”. Dr. Clark and his team have tried to pull back the covers and reveal the six symptoms that engaged employees exhibit. They are fast learners and adapt quickly to changing circumstances. They are constantly seeking challenges beyond their present area of expertise. They take the time and effort to help others and create organizational value along the way. The interesting insight this research threw up is that most organizations focussed only on one part of the elusive solution to Employee Engagement – their own contribution. Most organizations had little or no focus on the other equally important part – the employee’s personal responsibility to take action. The research by Dr. Clark concludes that high level of engagement happens only when organizations do their part and create the right conditions and employee’s then follow through and apply the right actions. The book then provides 6 drivers (Shaping, Connecting, Learning, Stretching, Achieving and Contributing) that individuals needs to apply while leaders work on creating systems and conditions to support them. By now, you must be wondering how to identify how many people in your team are disengaged or unhappy. It’s time to stop wondering and start acting. You could write a proposal to senior management for budget to get in an expert to do extensive surveys, establish a team of data scientists and behavioral experts to run analytics on employee engagement levels in your team by pulling out every bit of information and looking for patterns or you could do the following six things, starting right now. 1. Spend time with your team: The best thing you can do is give them your time. Spend a little less time on email and phone and dashboards and take the time to go talk to your team members. Ask questions. Take the time to listen. Understand their motivations, their fears, their pain points. Crack a joke or two and laugh with them. Open out to them with genuine concern and show it by following through with the best solutions you can come up for the problem areas you encounter. A small gesture can go a long way in building trust and relationships. 2. Focus on the achievements: In the daily stress of deadlines, targets, budgets, we tend to put undue focus on the things that go wrong or things that don’t measure up. But every day, your team is also doing a whole bunch of things right. Focus on those and let everyone know about small victories. This not only motivates the team but also fosters a sense of camaraderie. 3. Be honest and respectful: There will be times when you will need to tell some team members to improve. When you do so, explain the context, be honest but most importanttly be respectful. Take the effort to listen to the team members side of the story and work with him to find a solution to the problem. 4. Involve your team in the process: Team members feel responsible and are better engaged when they are part of the solution rather than when they are just executing orders. When you ask your team for ideas, you will be surprised at the innovative solutions they can come up with. Set up small groups to brainstorm for solutions to the challenges that the team is facing and give them a say in the direction being set for the team. 5. Ask for help: When leaders ask their team for help, it signals their honesty and openness – two essential ingredients to building relationships. And when the team members have a honest and open relationship with their peers and with their leaders, success is sure to follow. 6. Personalize your interactions: You can’t hope to engage everyone on your team with the same approach. Some like structure and planning in everything they do, others like to just drop in for a chat and take it from there. Understand the personality of your team members and interact with each accordingly. Set aside your own biases and work with your team based on their preferences. Invest Time – Identify winners – Connect – Engage – Recognize and your business success is practically assured.